Ian then provides a brief but thoughtful (and spoiler-free) review of War Stories: Modern Military Science Fiction, a crowd-funded anthology edited by Jaym Gates and Andrew Liptak, which he highly recommends. 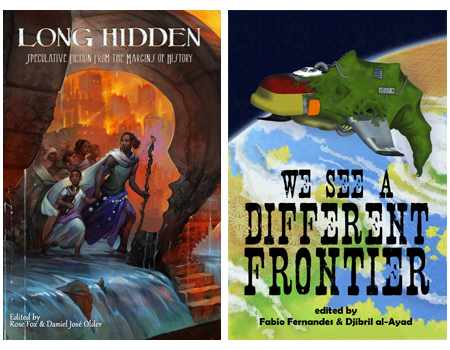 The two books up for critique on this episode are We See a Different Frontier: A Postcolonial Speculative Fiction Anthology edited by Fabio Fernandes and Djibril al-Ayad (beginning around 22:05) and Long Hidden: Speculative Fiction from the Margins of History edited by Rose Fox and Daniel José Older (1:01:35). If you've skipped ahead to avoid spoilers, please come back at 1:53:05 for final remarks. For the next episode, Kirstyn has chosen We Are All Completely Beside Ourselves by Karen Joy Fowler while Ian is recommending Dust Devil on a Quiet Street by Richard Bowes. Read ahead and join in the spoilerific fun!